George W. Bush – HEY, IT'S PAT RYAN'S BLOG! Even though the easy and obvious answer should be easy and obvious (duh), a disturbingly large percentage of our fellow Americans aren’t satisfied with taking the easy way. Good for them, I say: it demonstrates their exceptional American characteristics of ingenuity and perseverance to come up with these unconventional answers, while generating easy laughs for us lazy slobs whose consciences take no offense when we just skate by, exercising nothing more mentally rigorous than logic and reason. Just so much harmless kookery, right? Yes, but what about the 20% who believe the government is hiding a link between autism and childhood diseases, or the 37% percent who believe global warming is a hoax? Those people act on their beliefs to the detriment of the futures of both their children and the planet they share with the rest of us. What does it say about our society when, more than ten years after the fact, 44% still think that our then-president took the nation to war on a personal vendetta against Saddam Hussein, and another 12% aren’t sure? What about the people who had elaborate explanations for the Boston Marathon bombing the day after it happened, before anyone but the bombers themselves could possibly have known the truth? For starters, I suggest you check out the Bad Astronomy blog on Slate, where Phil Plait recently vented a little about the march of antireality in general and just today about the links between the anti-vaccine nuts and the measles outbreak in Wales. He has a clear-headed approach and a clean writing style that I think you’ll appreciate. After that? I don’t know for sure…perhaps we can all get some good advice from the 14% who believe in Bigfoot, or the 9%, like Gen. Jack Ripper, who are convinced that fluoridation of our water isn’t just about dental health. 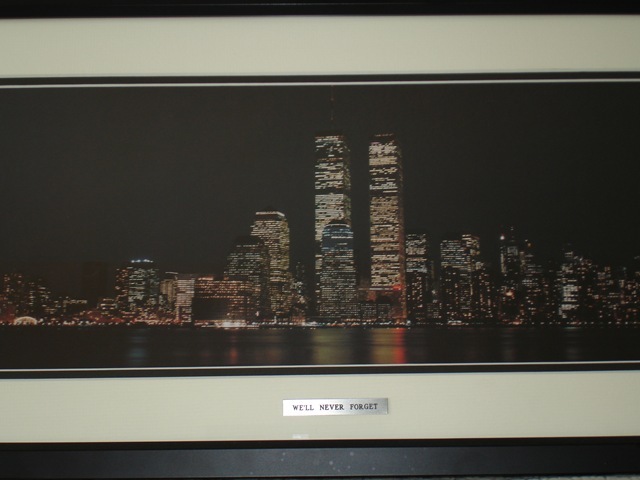 In the entry hallway at our house we have a framed picture of the night skyline of Lower Manhattan as seen from New Jersey, the twinkling twin towers of the World Trade Center the focal point. The caption under the photo reads, “We’ll never forget.” Not forget what happened that day? That’s the easy part. I didn’t move from the TV. Another plane hit the Pentagon. I watched the towers collapse, fascinated at how they seemed to accordion down on themselves, and not believing the size of the dust cloud they sent up. Then we were all sent home from our government office in Houston because no one knew what might be the next target. I sat in front of my television at home the rest of the day trying to get it all straight in my head—what do we know, as opposed to what we think we know—as I had done sitting at a microphone in a radio studio in Houston more than 15 years earlier, on the day space shuttle Challenger blew up. In the next few weeks we learned that the hijackers who died along with almost 3,000 innocent victims on September 11 were connected to a global terrorist network called Al Qaeda, founded by Saudi-born Osama bin Laden, and which was implicated in prior attacks on American targets around the world. Apparently, Al Qaeda was attacking those it saw as enemies of its fundamentalist interpretation of Islam. Before the end of the year, President Bush sent American troops to Afghanistan to get bin Laden and other Al Qaeda leaders and their protectors within the Taliban. We’ve been at war ever since. Not just an impossible to quantify war on “terrorism,” which is really more a tactic than an enemy, but an actual boots-on-the-ground bullets-in-the-air war, and there’s still no end in sight. One big reason, I believe, is that “we” aren’t at war. Our armed forces are at war, and so are their loved ones, but when have the rest of us felt like we were at war? There haven’t been any shortages of goods, damn few protests, and no tax increases to pay for a war. Absent any kind of personal connection it’s not surprising that many Americans find it hard to remember that “we” have been fighting war constantly since late 2001—and for much of that time, two wars. We have come to think of it, when we think of it at all, as a perfectly normal situation; for many of our soldiers, sailors and Marines, being in a shooting war is all they know professionally, and what their spouses and kids assume to be a normal life. We went to war in Afghanistan to get the people who attacked us on September 11. We finally killed Osama bin Laden in Pakistan this year, but there’s no sign of an end to our presence in Afghanistan. We went to war in Iraq to…go ahead, you fill in the blank, but we know it wasn’t to get Al Qaeda, since they weren’t there, or to stop Saddam Hussein from using his weapons of mass destruction, which also weren’t there. Ironically, the war we chose to fight in Iraq only strengthened our enemy there, if it didn’t actually create an enemy where he didn’t previously exist. Last month, some eight and a half years after that war began, was the first month that there were no American casualties in Iraq. The attacks of September 11 were a shot to the solar plexus of the American people. In the immediate aftermath we did what Americans do after a surprise attack, whether from a mortal enemy or from Mother Nature: everyday men and women responded heroically in the face of the crisis, then we all took care of those who needed to be taken care of. We opened our hearts and our purses without complaint or even a second thought, and helped each other through until the shock wore off, then turned our attention to those who attacked us. Unfortunately, we didn’t see the second surprise attack, the one launched by cynical politicians and government functionaries who took advantage of our fear and anxiety. The news media, shamefully fearful of even being accused of being less than loyal patriots, stood by and let officials get away with murder, in the figurative if not the literal sense. We let our fear overpower “the better angels of our nature” and spent parts of the next ten years squandering our time, our treasure and our good karma. We crawled all over each other with demonstrations of the trappings of patriotism as if that was all that was required to be a patriot, as if claiming allegiance to America’s ideals was just as good as living up to those ideals when it really matters. We let natural wariness in unusual circumstances turn into fear of The Other. We treated Americans who are Muslim, and those who came here from the Middle East and southern Asia, as though they were in the cockpits of those planes in spirit that day. People whose only sin was that they practice a particular religion—including those in the peaceful mainstream of that religion, not in the violent, radical extreme—or trace their heritage to a particular part of the world weren’t given the benefit of any doubt but that they were enemies of America. How much time have we wasted on things like trying to ban shariah law, or trying to stop Muslims from building mosques where some loudmouth decided it’s not appropriate? How is it that we really spent breath fighting with each other over whether it’s all right to torture prisoners, or just OK to secretly send them to friendly countries where they do the torturing for us? Were we napping when the government enacted Patriot Acts at the expense of our own civil liberties? Why did we devote our time and energy to a blue ribbon investigation into ways we could better protect ourselves in the future, and then not implement the recommendations? How did we sit still for the manipulators who used this attack on our country to whip up sympathy for a war against a country (and its people) that had nothing to do with that attack, with the result that a larger number of Americans have died in that needless war—Americans who bravely, selflessly volunteered to protect the rest of us—than died in the original attack? And that’s to say nothing of the cost in dollars, and the resulting impact that has had on our national economy and well being. Back then, I thought that a few months after the attacks, when the shock subsided, we’d regain our perspective, but it seems that I was thinking about a different America, one which perhaps only ever existed in dreams: one where we followed the rules we set for ourselves, even when we were frightened; where people who hijack our airplanes and use them to kill thousands of our fellow Americans have the right to a fair and public trial; where, when crazy people who claim to adhere to the tenets of one of the world’s great religions but are in fact an extremist group led by a delusional maniac with a messiah complex attack our cities and our government institutions, we don’t ignore facts and logic to leap to the conclusion that every person in the world who practices that religion is part of a plot to get us. Today we have the chance to do better, and I believe we can. We can work to put aside our fear and get over the juvenile impulse to attack anyone different from ourselves. Let’s choose to deal with people based on who they really are and what they really do, rather than relying on our fevered imaginations to do our thinking for us. Let’s start, for example, by recognizing the difference between Al Qaeda and Al Jazeera, or the difference between a community center and a terrorist training camp. Not forgetting the events of September 11, 2001—that’s the easy part. If we don’t do the hard part, and act like the people we pride ourselves on being, then the terrorists have already won.